In the 2016 survey of UTC students, 65% say their work had improved since they started at the UTC; 86% say they are confident of getting a job suited to their skills when they leave education. They cited specialist equipment (79%), links with business (79%), employer projects (71%) and opportunities to get a step on the career ladder (62%) as areas better than at their previous school. University Technical Colleges (UTCs) are state schools that provide the opportunity to study technical and scientific subjects alongside the traditional GCSE and A level curricula. They were established to address the growing skills gap in subjects such as engineering, product design, digital technologies and manufacturing. At least 40 per cent of time is dedicated to your chosen technical specialism including employer-led projects, working in teams and problem solving. Q:Do UTCs work with universities? Each UTC works in partnership with a university and local employers to develop and deliver a combined academic and technical curriculum. This means UTC students benefit from access to the latest research, specialist facilities and teaching and mentoring from industry experts. There is an emphasis on developing work-place skills like communication and team work. UTCs typically start at 8:30 am and finish at 5:00pm, although students generally do their homework at school as each day includes private study periods. During school hours, students are expected to dress and act professionally – some have uniforms, but most have a ‘business’ dress code. Q:Who are UTCs aimed at? UTCs are aimed at 14-18 year olds and support students through all routes into the workplace whether via an apprenticeship, university or straight into a job. There are currently 39 UTCs; by 2018 there will be more than 55 open across the UK. Q:How many UTC students go on to higher or education or work? In 2015, 42% of UTC leavers went to university compared to 37% nationally, while 24% started apprenticeships compared to 8.5% nationally. In total, 97% of students who left a UTC aged 18 either went on to higher education, started an apprenticeship or started a job. If your passion lies in engineering, technology or design and you thrive in a practical, hands-on learning environment, then a UTC could be for you. Find a UTC in your area and see where it could take you. Q:Where are you currently studying? I always knew I wanted to go into engineering, I have a constant need to know how things work and how they are put together. I went to several open days at the JCB Academy (UTC) in Staffordshire and was impressed with the quality of the teaching and facilities it offered. I was able to study maths and physics A levels and complete a Diploma in Engineering. Q:What was so beneficial about studying at a UTC? I particularly valued the opportunity to work with world class companies like Bentley and JCB and apply my learning to real life projects. The key difference for me was that everything that you learn was for a purpose….you gained real life experience with in global companies, making you ready to be integrated into them in the future. Q:What are you up to now? I was keen to build on the work experience and skills I’d gained with JCB and saw the organisation as the perfect company to help develop my dream of being an engineer. 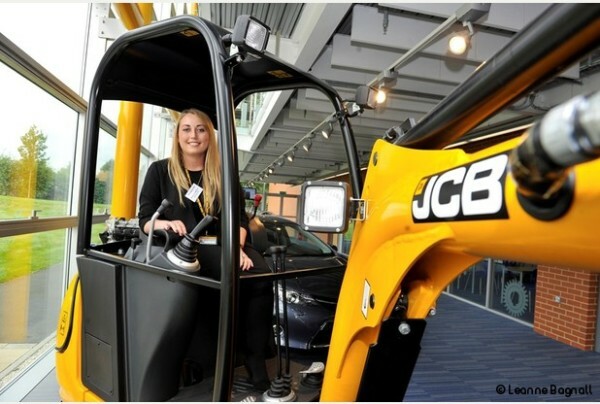 As a higher apprentice, I spend one day a week at Sheffield Hallam University studying for a Mechanical Engineering Degree and work as a design engineer at JCB Compact Products for the remainder. I am able to work and learn at the same time.